The Canada West Regionals have recently sent us highlight videos of Day 1 and Day 2. 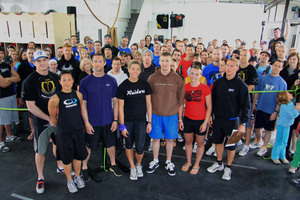 The Regionals were setup and run by OPT (James Fitzgerald). Saturday WOD1: "Every Rep Counts"
Sunday WOD 3: "Pick it Up and Put it Overhead"
Placement based on SIFF weightlifting formula which uses max successful lift and bodyweight to rank athletes. really like the programming of that qualifier. very well rounded set of movements. overall it looks no one body type could dominate. very crossfit. 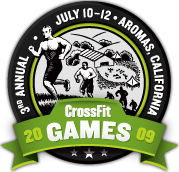 when planning a crossfit competition i think makes a real good model to follow. When we first saw the set of WODs that OPT had come up with for his fellow Canadians we thought they were clever, but after seeing them in action & reviewing the scoring system we believe they are genius. I could not agree more Ken. This is a stellar bit of planning from OPT & my vote would be to install him as chair of whatever competition committee HQ has in place. It could certainly only help to have his insight in the planning of the future of the sport. Great job James. The music made me feel like I was watching a Nintendo's highest score screen when the top times came up, haha. in my opinion the best set of WODS to determine a crossfit athlete. It did not favor tall or small, thick or thin. It favored the best crossfit athlete. The workouts encompassed all things crossfit. none of the movements were of the super skilled variety such as muscle-ups or HSPU's so everyone could participate giving it their all to determine who had the best work capacity. OPT is the man. Seriously, seriously doing it the way it should be done. thanks for the link to opt blog. that programming is what I call art! Thanks to James/OPT for all you do for CF, love the programming on your WOD. I'm pretty new to CF, but once I get my performance and nutrition up to snuff I will be switching to your programming.